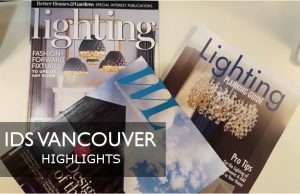 Posted October 15, 2017 by Norburn Lighting and Bath Centre & filed under Events . We got you covered. 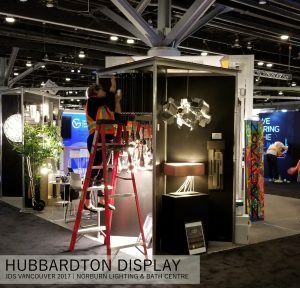 Last week, Norburn Lighting and Bath Centre took part in the annual Interior Design Show that ran from September 28 to October 1, 2017. 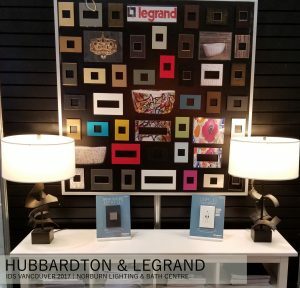 We featured items from Cerno, Varaluz, Hubbarton Forge, Legrand, Satco, Schonbek, Fine Art, Wac, Modern Forms, and Aquabrass. 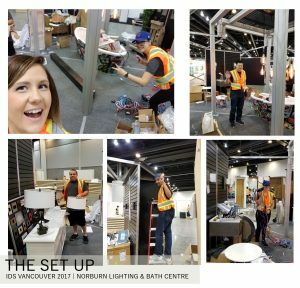 Before the show began, our team worked together to set up our displays. 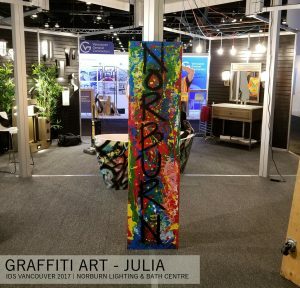 Custom painted graffiti Norburn signs were created by our very own Julia Tyrrell. 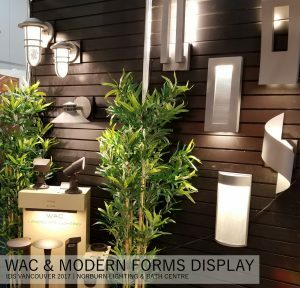 Our Outdoor display featured items from Wac and Modern Forms. 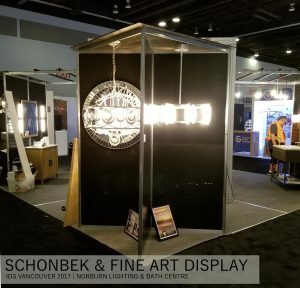 Adding sparkle to our booth were the Gwynn pendant by Schonbek and the Allison Paladino pendant by Fine Art. 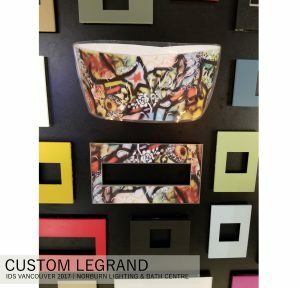 Our Legrand display featured a custom plate to match the graffiti tub at the center of our booth. The Legrand wall also featured pops of bright coloured plates that pulled together the vibrant colours from the tub. At each end of the table, beautiful Hubbardton Forge table lamps were displayed, the base of the lamps are works of art on their own! The Cumulus pendant, a new introduction from Vermont Modern, was featured in our Hubbardton Forge display which is designed with 18 plates of silver steel for a textured look. Adjacent to the Hubbardton Forge display was the Acid Pendant by Modern Forms. The Acid pendant is made with chrome-plated metal shades that are sculpted in various forms and arranged at different heights. 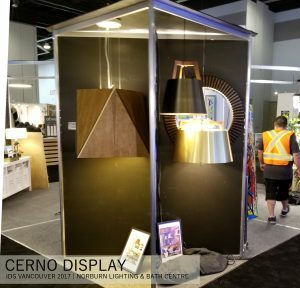 The Calx pendant was one of the featured pieces from our Cerno display. The Calx is designed with multiple triangular panels in a walnut finish, the interior of the shade is lined with brushed brass adding a pop of metallic. 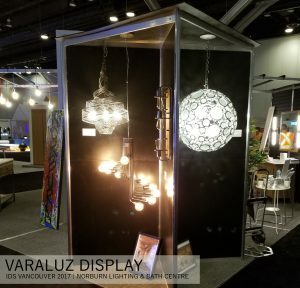 Everything about the Socket-to-Me by Varaluz exhibits a bold statement. The cascading arms create a spiral structure made of alternating exposed bulbs and hand-forged recycled steel arms for a perfect industrial edge. 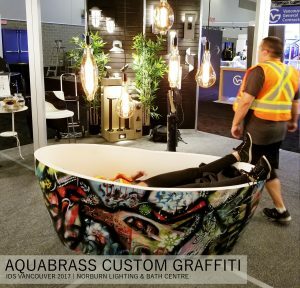 The pièce de résistance was the custom graffiti tub by Aquabrass located at the center of our booth. The tub is made from stone resin and designed with striking pops of colour. Large vintage bulbs, new from Satco, were suspended above the tub for added visual depth. Let us know what you thought of the displays. We can’t wait for the next event!